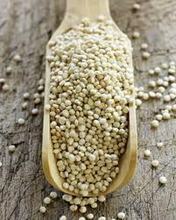 Quinoa (pronounced Keen-wah) is a nutritious gluten-free grain alternative and is in fact a seed from a vegetable linked to swiss chard, spinach and beets. It is considered a super food and is high in protein, with a good balance of all 8 essential amino acids, making it a good choice for vegetarians. It is also high in fibre and has a low-GI, beneficial for keeping blood sugar levels stable as well as having a slightly alkaline effect on the body. 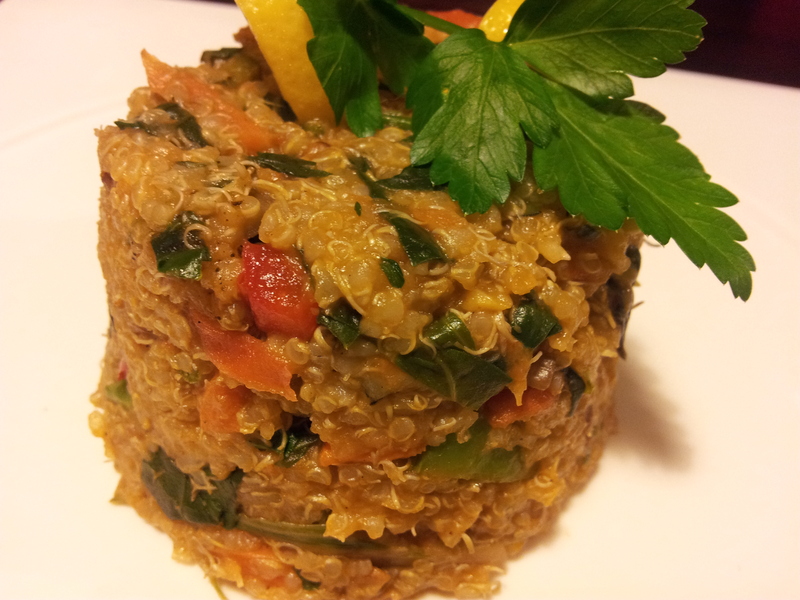 This dish was very quick to make as l pre-cooked the quinoa and the flavours in it were lovely. There was a strong hint of lemon, a crunch from the walnuts and a flavour kick from the addition of fresh ginger and cumin. The risotto is quite sticky so it held together nicely when l placed it in a glass ramekin to shape. I was inspired to make this risotto as l have a vegetable garden filled with greens including masses of silverbeet. There is no need to follow my recipe to the letter as part of cooking is having fun and experimenting with new ingredients and flavours, and my cooking is quite plain due to food intolerances, so you may wish to spice it up a bit more. Cooking quinoa requires some pre-planning as it needs to be soaked and rinsed prior to cooking. I soaked 2 cups of quinoa in filtered water all day and then rinsed just before cooking to remove the bitter tasting saponins. You can soak it for a shorter time such as 30 minutes if that is all the time you have. I placed the rinsed quinoa in a saucepan and covered with filtered water so that there was about an inch of water on top of the grain. I brought it to the boil, then let it simmer with the lid on until the water was absorbed and the seeds had popped open. You can turn the heat off at this point while the rest of the dish cooks. In a fry pan place a splash of olive oil, the organic tomato paste, tomato, red capsicum and cumin. Let that cook for a minute then add the quinoa and mix well. Now add the rest of the ingredients and season well to taste with pink rock salt and ground black pepper. Give it a good mix for a couple of minutes and serve. I spooned mine into a ramekin, then turned it upside down and let it slip out onto the plate. It looked lovely when it was on the table garnished with lemon rind and parsley. If you don’t have the ingredients listed just use what you have in the fridge and you can also make the risotto the traditional way by adding the liquid in small intervals to the uncooked quinoa. Below l have included a link to my favourite supplier of all organic goods such as quinoa and other pantry essentials. They offer a great service and very good prices with free delivery if your purchase is over a certain amount which is listed on their website depending on your location. A fabulous online store for my Australian followers. If you have enjoyed this post please share with a friend. You can also follow me on Instagram at holistic_paleo where you will get daily photos of the meals l prepare and a few other interesting things aimed at inspiring a healthier life.